Most companies look at Lost and Found as a burden. Our clients disagree. By working using Crowdfind, they have defined their Lost and Found Process and turned it into a customer engagement tool. Download our Lost & Found Software white paper to see how you can improve your lost and found process. 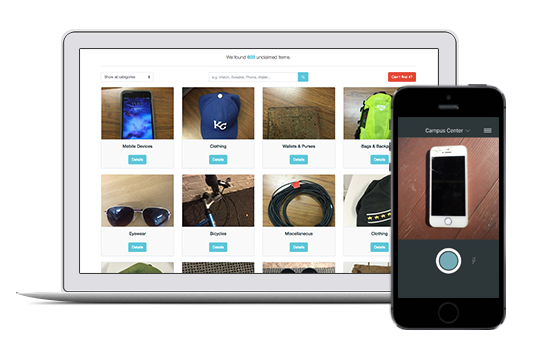 Crowdfind’s Lost & Found software is as easy as taking a picture. Track inventory, manage claims, facilitate matches, chat with customers, create automated reports, and return items via our shipping integration all from one place! Download our Lost & Found Software White Paper to learn more. Crowdfind is the world’s premier Lost and Found software and services provider for Venues, Events, Hotels, Colleges, and Transportation Agencies. Located in Chicago, our software integrates into your website and mobile applications to simplify the Lost and Found process for your customers and staff. Crowdfind Lost & Found software integrates into your website and mobile apps by just snapping a picture. Customers can search through the pictures online to find their lost items at any time of day. Using Crowdfind’s Lost & Found software dashboard, your staff can communicate with your customers easily. You can take advantage of our custom Lost and Found claim forms to collect information to verify matches and coordinate returns from one place. Your staff can also create custom, automated reports from the dashboard. These reports can show you how many items are recovered at your location, how many matches are made, what items are lost most, and more.